I go on binges and make a whole bunch of cards and tags to stock back up. I thought I would show you a few of the cards that I have created. I used die cuts that came with this paper and just mounted them on pop dots on this card. I love using the twine especially when the sentiment is about never unraveling. 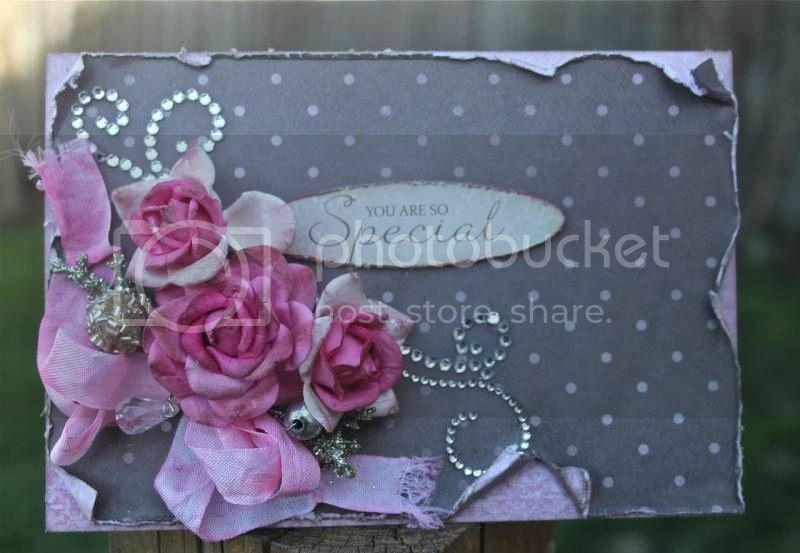 This card was meant to be simple and to let the flower take centre stage. I used Maya Road lace on the skirt and actually made a skirt. 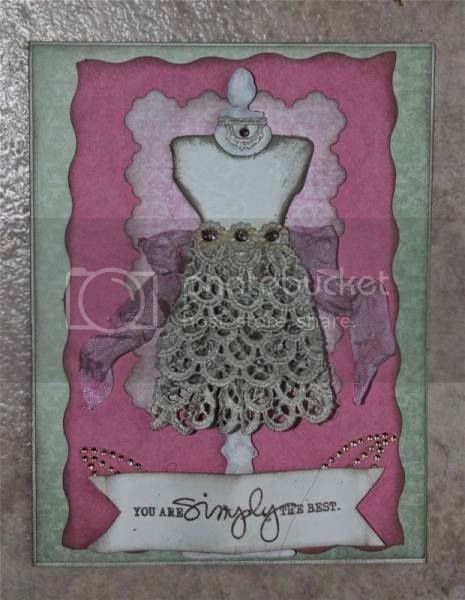 The Tim Holtz die never was dressed up so well! I cut another piece of the lace and used it as a choker. The seam binding was dyed to match the roses. Lots of distressing on this card. This is one of the cards that my daughter took for an upcoming birthday she was going to. I love the sweetness of this card. 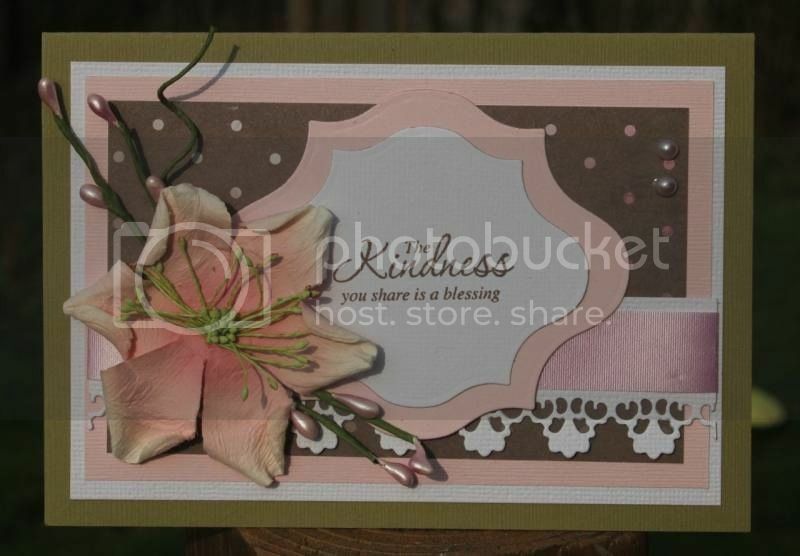 Lots of stamping and inking and die cutting went on in the creation of these cards. (you can never go wrong with stamping, inking and die cutting) I like re-purposing things too… see the thread under the flowers on the last card? 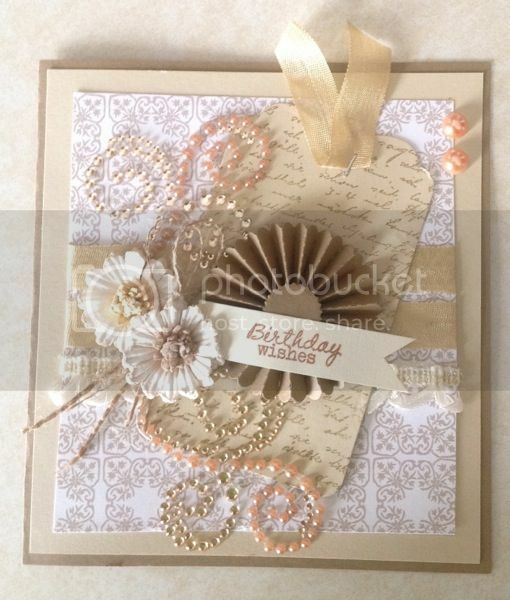 That is a couple of strands of burlap that I had pulled out from a big piece of burlap to use on this card. I really like using twine and rhinestone flourishes too. I think the stash is replenished for the time being….. until the mood hits me and I start creating again!